We all know about the THEORY OF EVOLUTION by Charles Darwin. But this MY version. 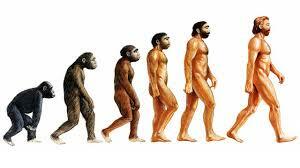 We evolved from homo-sapiens to something sapiens to something sapiens to man. We have reached the extent of evolution. THE extent. We couldn’t evolve more. We now know EVERYTHING. After some 20 decades or so, electricity would be endangered AND it would become extinct. Because of no electricity , other natural resources would flourish ( like water, air etc..) Petrol and diesel which is used to run the world would become more and and more scarce. Petrol and diesel rates will increase and can go up to as high as a gold rates . THEN WHAT WOULD HAPPEN ? As the poor among us couldn’t afford petrol and diesel they would start using cycles( which is a healthier means of transport , by the way ). We already started wearing dresses The Old Style which was used in 1970 s or so. Now the latest trend is to go the old trend. WHY ?doYOU NOTICE A CHANGE ? A PATTERN ? WE knowingly or unknowingly end up following our old traditions, customs and beliefs. so We go back. We have reached the end of our road . We have evolved as much as possible. We couldn’t evolve more. So we go back in our road . So my theory is that as we have reached the extent of civilization, we go back following our old traditions in the 1900 s. That age . No electricity . No pollution. The Golden Age. and then we will further evolve back to 1800 s . Where kings and queens occupied our land . and then we slowly evolve back and back and back and back until we finally reached the Stone age in the form of monkeys. like how we first appeared on the earth. AND then we disappear from this world completly leaving this world to animals and god.